A long, long time ago Wednesday meant fresh flowers. Sometimes a single rose or lily, but more often than not bunches of my favorite peonies or gerbera daisies. It’s just something my first husband, Greg, always did. Even when we were dating, flowers often arrived on Wednesdays just because. When we were married, he came home from work every Wednesday with flowers in hand. Sometimes from the fancy florist. Sometimes a bunch from the grocery store. He once told me Wednesday was the day you needed a pick me up to get you through the week. So, Wednesday meant flowers. Then, suddenly when Greg died, the flowers disappeared with him. I didn’t realize just how much his weekly gift meant to me until I didn’t receive them anymore. Suddenly, Wednesday was just Wednesday. And it was a weekly reminder that Greg was gone. Greg used to also always have flowers delivered to my mother on MY birthday – thanking her for giving birth to me. I know. It’s beyond the norm. That’s just the kind of guy he was. When my first birthday rolled around after Greg’s death, and my mom didn’t receive that special delivery, she admitted not receiving his bouquet hit her hard. It was like a huge slap in the face that this is awful thing actually happened. That someone we loved so much was gone. Because none of us ever wanted to really believe it. Because when you are experiencing such grief and raw, isolating pain, despite the reality all around you, you can convince yourself it isn’t real. About a year after Greg died, when I was living on my own again in West Hollywood and had a little extra money to play with, I started buying flowers for myself every Wednesday. I would walk into the Trader Joe’s across from my apartment and just buy flowers. Groceries, liquor, emotional eating necessities like dark chocolate and frozen molten lava cakes were purchased on other days. Wednesdays were for flowers, and flowers only. So I explained. And by the end of my explanation, we were both in tears. She didn’t charge me that day for my flowers. She told me they were her treat. I will never forget that. And, in that moment, I realized what Wednesday really was. The day that kept me stuck between both my past and my future. Holding on tightly to my memories and what was familiar while also trying desperately to make room for something new. Wednesday – the weekly reminder that life was never going to be the same. So, I decided that instead of flowers on Wednesdays, I would do something just for me – something that would help me forge my way into my “new” future. I hiked. I ran around Lake Hollywood. I saw movies. I shopped. I slept in. I tried hip new restaurants and dined alone. I lied to clients and told them I was in court all day when really I was at the beach. I figured out who I was becoming and who I wanted to be now that I was truly on my own for the first time in my life. Just me. Taking care of me. I laughed. I cried. A lot. More than I ever thought I could. I opened my heart and let love in again. I found joy. I made peace with what had happened. I forgave myself. I allowed myself to have a future. I also decided that I liked my flowers. And if nobody else is gonna get them for you, it’s ok to get them for yourself. I still buy myself a weekly bouquet. 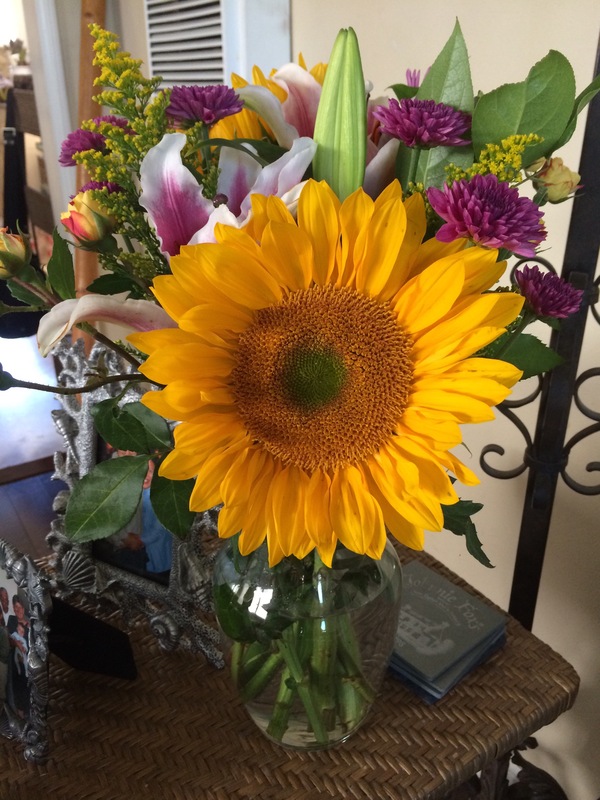 It’s usually on Friday now, and now I often pick out my husband’s favorite sunflowers or let my sons choose what they like. Peonies and gerbera daisies are still favorites. But I always know I am here, in this place, in this moment, because of someone who believed strongly in the power of flowers on Wednesdays. And now, instead of sad, I’m just so grateful.